As a result of being “in the business” I have access to what some would say is a fairly large collection of handguns. Some are plinkers, some have historical significance, some are used in the classes we teach, but a few have one purpose: personal protection. Personal protection includes guns I wear every day, plus a couple of “house” guns and my “truck” gun. Let’s talk about my carry guns. I have two favorites, both 45s. 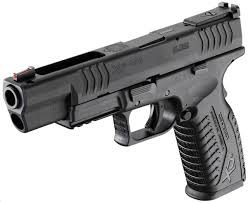 One is a full-size Springfield XDm with 4.5-inch barrel, 13 round magazine and night sights. I wear it in an inside the waistband (IWB) Crossbreed Super Tuck holster. The other is a Smith & Wesson M&P (Military & Police) with a 4-inch barrel and night sights and a 10 round magazine. I use the same Crossbreed Super Tuck holster for both guns. I also carry a spare magazine for either using a Crossbreed IWB magazine holder. I shoot these guns often enough to have absolute confidence in them. They’re both extremely accurate and 100% reliable. I have never had any type of failure with either gun, regardless of the ammunition being used. This makes me sometimes smile when I read an article written by an obvious 1911 aficionado talking about how the 1911 is the most reliable, durable, accurate, sweet-shooting, etc., etc. handgun ever built. Give me a break! I have two 1911s. Neither will outdo the Springfield XDm or the S&W M&P. Although I’m somewhat partial to the 45 ACP round for personal defense, the 40 S&W cartridge has proven just as effective and it does allow you to carry more rounds. My S&W M&P has a Streamlight light and laser combo on it and has become my primary house gun. Sometimes the mood just hits me to carry a 40 caliber handgun. When it does, I have two choices. 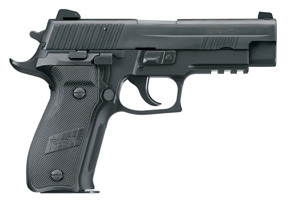 The first is a SIG Sauer P226 Elite. You can always count on a SIG. They are known for their ruggedness, reliability and accuracy. With 13 rounds in the gun and another 12 in my belt, I always feel well-equipped to handle any threat. 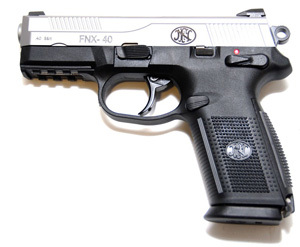 My second choice for a 40 caliber gun is the FNX-40. This gun is built like a Sig, but has more features than any other gun I own. Everything on it is ambidextrous including the slide lock, frame-mounted safety-decocker and magazine release. The FNX-40 endears itself to anyone who picks it up, holds it, sights with it and shoots it. Mine is so doggone pretty, I sometimes just like to look at it. It has a 14-round capacity and came with 3 magazines. What about 9mm, you may ask. Well, I love shooting 9mm pistols and have several. My truck gun is a 9mm Sig SP2022. I have a Beretta M9 and a Beretta PX-4 Storm, both excellent shooters. Other than my wife’s Glock 19, that’s all the 9s in my arsenal right now. But I’ve recently owned a SAR B6 and SAR K2, along with a Witness P 9mm. Because of the shortage of inventory since the last election and the tragic shooting in Newtown, CT, I’ve sold all of those guns to people who needed a good reasonably priced handgun and couldn’t find one. I figure 3 (or actually 4) 9mm handguns is enough for now. But when I do replenish, I’m likely to include the Turkish and Italian guns just mentioned, along with perhaps a Springfield XD in 9mm. And I had a 9mm S&W M&P but let that one get away from me, too. Maybe when they become available again I’ll get a Compact 9mm M&P. Some time after writing this article, I became enamored with the Commander Size 1911 as a carry gun. All of my 1911s are .45 ACP. I’ll occasionally carry a 9mm M&P or a 9mm Sig P229, which is what I happen to have on today while writing this update. I almost totally got away from .40 caliber for a while, simply because of recoil. Since discovering Ruger and Polycase ARX bullets in late 2016, I’ve discovered I can shoot .40 caliber with no problem. So I put the .40 M&P back in the rotation from time to time. Why do I carry different guns from day to day? I don’t know? Why do you have a lot of different shirts in your closet? I just like variety. And I like to be able to tell someone who is considering a gun that I have experience with that particular gun (but only if I really do) and here’s what I think/know about it. Previous Previous post: Air Gun Fun!